Stinging nettle is a leafy herbaceous plant that grows as a wild green all over the world in mild to temperate climate zones. 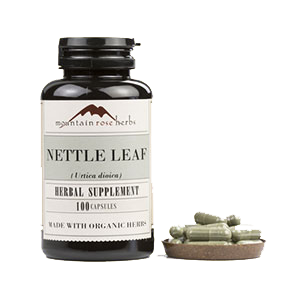 One of nature's top nutritive herbs and vitamin-mineral rich plant-based supplements, nettles are available, FREE for the taking, in many forests, foothills and coastal locations worldwide. The common nettle plant has been valued for centuries as a nutritious tonic tea extremely dense in energizing substances and unique plant constituents that are nourishing to the blood as well as cleansing to the body. Containing antioxidant activity and a number of phenolic compounds, research studies analyzing the leaves, roots and stalks have discovered many phytonutrients including quercetin and rutin flavonoids, in addition to chlorophyll, lecithin, beta-carotene and lutein content. Utilized as a food source and medicinal herb taken as a folk remedy for a number of health issues such as anemia, gout, eczema and arthritis, the wild stinging nettle plant has a rich history of use in European herbalism. 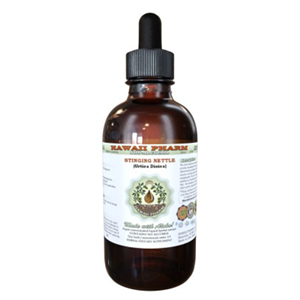 Today it is commonly used among modern day herbal practitioners for the treatment of urinary disorders, hay fever and is shown to be helpful for prostate gland enlargement as well as reducing the symptoms associated with menopause. 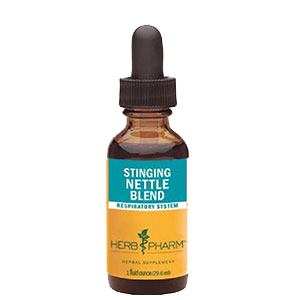 Acting as both a diuretic and lymphagogue, stinging nettle benefits are stimulating to the lymph system and useful for alleviating conditions like hyperuricemia and metabolic acidosis. The most predominant species, Urtica dioica, is said to get its name from the Anglo-Saxon word "noedl" which means "needle", and its Latin name "urtica" which means "to burn." This gives reference to the stinging effects of the tiny hairs on the stems and leaves which cause a burning sensation and temporary rash when rubbed against the skin. 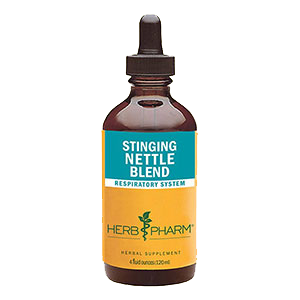 While nettles can be quite invasive, similar to dandelion, they are one of the most common wild herbal foods used around the world for their health enhancing qualities. Although they can grow like weeds, they are also widely cultivated and sold commercially as a dried herb, freeze-dried powder, encapsulated supplement or tinctured extract. In the words of herbalist Rosemary Gladstar, "Nettle may be one of the herbal wonders of the plant "queendom." Its usefulness can be traced to antiquity and its popularity as a medicine and a food has hardly waned. True, if you've never been introduced to the virtues of herbs, you've probably never even heard of the positive side of nettle. As a matter of fact, the very word probably conjures up visions of painful welts and dermatitis. 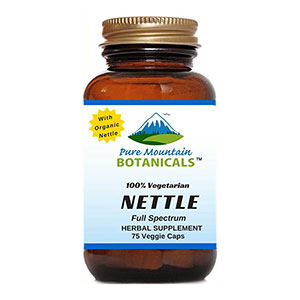 But nettle is beloved in the herbal community and is one of my personal favorites." Common stinging nettle (Urtica dioica) is a perennial plant native to parts of Europe, Asia, North America and Africa. There are several subspecies of Urtica dioica, with some stingless varieties, like Urtica galeopsifoli (a European variety), that actually do not have stinging hairs present on the leaves and stems. Most do, however, have tiny (nearly invisible) hairs referred to as "trichomes" or needle-like tips that when touched by the skin can inject a fluid containing certain substances like formic acid, the same chemical that causes ant and bee stings. Several other compounds present in the trichomes may also include histamine, acetylcholine and serotonin. 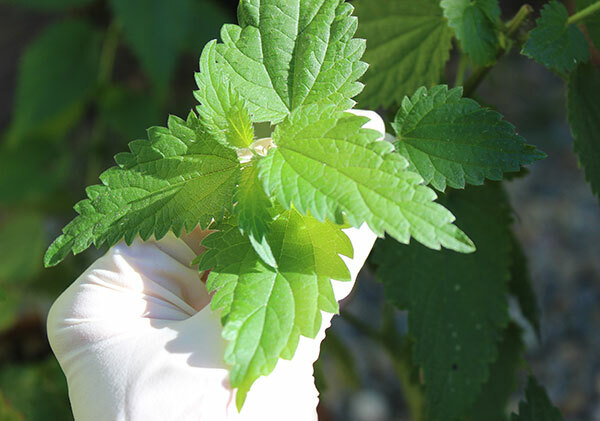 Generally, when rubbed against the skin, stinging nettle causes a prickling or burning sensation that usually lasts for several hours and may cause swelling or a red rash depending on one's level of sensitivity. These hairs, naturally designed to help protect the plant from insects and predators, are deactivated when the plant is steeped, steamed, macerated, dried or prepared in an alcohol or vinegar solution. The juice of nettle, as well as other herbs that grow next to it, like dock or purslane, can be applied topically as a remedy for the sting to relieve the itchiness. 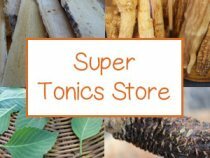 Although the roots, stalks, stems and seeds can all be used therapeutically, the leaves are the primary part consumed as a prepared food source, infused, juiced or tinctured. While all stinging nettle species have similar nutritional properties, the large and robust varieties are believed by some herbalists to be of greater nutritional value. Nettle, with its tough fibrous stalks, has also been used by cultures around the world for industrial purposes and utilized for centuries as a fiber source for making textiles, twine and rope, much like that of the linseed or hemp plant. Nettle leaves are oblong, pointed with a saw-toothed edging. They produce green seed pods and tiny green-white flower clusters which develop on the leaf axils in the summer season. The plant often grows in partially shaded moist soils next to other wild edible species like mallow, dandelion and chickweed. Once located, you can typically expect patches of nettle to propagate in the same place every year. Reaching heights of between 2-4 feet, they tend to grow well in nitrogen-rich garden soils and even disturbed urban habitats, but are also very common in wild woodland regions, meadows, coastal locations as well as along riverbanks and creek beds. 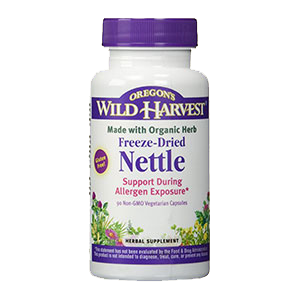 Nettles are a powerful herb, food source and natural plant-based multivitamin. 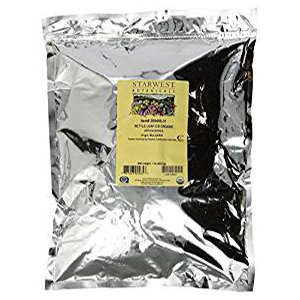 Their high concentrations of nutrients are easily assimilated as a tea infusion, providing a wealth of liquid nourishment that has energizing effects on the body systems. Likewise, the fresh leaves and young nettle shoots can be prepared as a lightly steamed leafy green vegetable or used as an ingredient in green juicing recipes. Dark brown-green nettle teas are full of highly digestible vitamins and minerals, like iron, calcium, potassium, magnesium, B vitamins, vitamin C and vitamin K. Nettle leaves are also found to contain many phenolic compounds and flavonoids, silicic, folic and pantothenic acids in addition to chlorophyll, lecithin and carotenoids like lutein and beta-carotene (vitamin A). Concentrated tea infusions are a rejuvenating restorative tonic for malnourished, depleted, anemic or excessively weak individuals. Containing free amino acids, juiced or lightly steamed nettle leaves are also a protein-rich vegetable source and can be very beneficial for post-traumatic healing from wounds or injuries. Appropriately prepared raw nettle shoots or the pressed juices, are often known to boost energy levels and uplift one's mood. This is thought to be in part due to its alkaloid content and nutritive value as well as some of the transferred phytochemical compounds like histamine and other neurotransmitters like acetylcholine and serotonin. 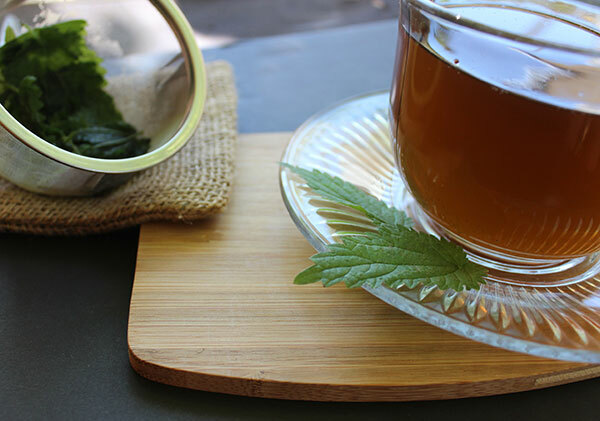 Iron and calcium-rich nettle teas are very beneficial to menopausal women and, when consumed on a daily basis, are useful for diminishing hot flashes, night sweats, fatigue and help to provide nutrients that may prevent bone loss. Nettle can also be a valuable herbal supplement used throughout pregnancy as a nourishing energy tonic and natural diuretic. It is a long-used remedy for hemorrhaging during childbirth and for increasing the flow of breast milk in lactating mothers. 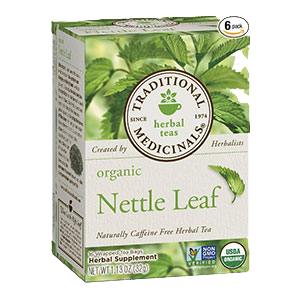 It is best, however, to consult your healthcare physician before using nettle teas or extracts if pregnant or nursing. 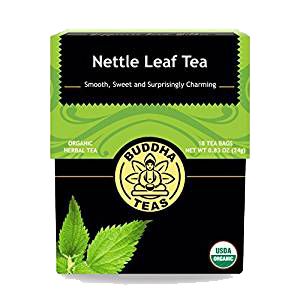 Consuming nettle leaf teas, juices and extracts in concentrated doses on a regular basis are cleansing to the body and especially therapeutic for the urinary system and related health conditions involving the kidneys and bladder. According to Rosemary Gladstar, "Because of the importance of the kidneys, nature is generous in her proportion of herbs beneficial to their functioning." Prolifically growing wild nettles are one of these such herbs that are particularly respected for such purposes. Herbal diuretics, like nettle leaf, specifically increase the flow of urine and are helpful in removing excess fluids, encouraging greater elimination of waste material from the tissues and joints. Nettle helps to stimulate and maintain normal kidney functioning, soothe irritation of the urinary tract and provides antiseptic qualities. Dried or fresh nettle tea infusions are very alkalizing to the body and urinary systems, assisting in the reduction of acidic conditions and the removal of uric acid build-up, especially beneficial to those with hyperuricemia, gout and metabolic acidosis. The roots of the nettle plant have also been shown beneficial in some research for their effects on the male genitourinary system, which includes both the urinary and reproductive organ systems. 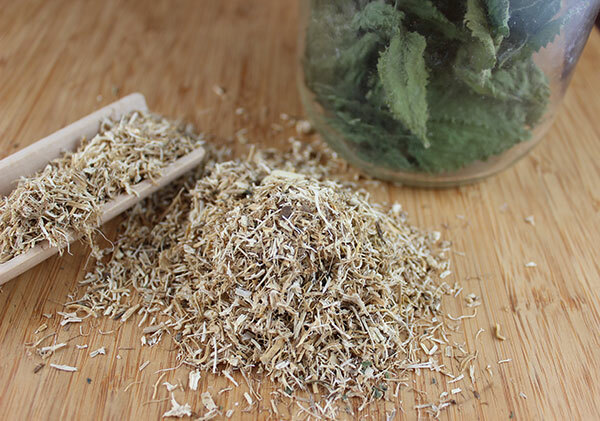 Nettle root extracts have been proven beneficial for men with acute bladder infections caused by benign prostatic hyperplasia or enlargement of the prostate gland. When the prostate gland is enlarged it presses on the urethra, the tube that releases urine from the bladder. In a study published in the World Journal of Urology, elderly male patients suffering from lower urinary tract symptoms were tested in a double-blind study using combination of sabal fruit extract and nettle root extract. Results indicated that the extracts (PRO 160/120) were "advantageous in obstructive and irritative urinary symptoms and in patients with moderate and severe symptoms. 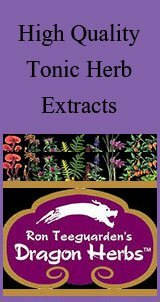 The tolerability of the herbal extract was excellent." According to a 2015 study, "it was concluded that prostatic hyperplasia could be reduced by oral administration of nettle root extract" and that "it has protective effects on prostatic hyperplasia" with similar effects to that of finasteride, a drug used to treat this ondition. 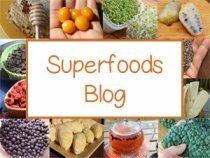 This influence is still under investigation, but is currently believed to be due to its properties as an anti-inflammatory agent as well as its ability to inhibit the aromatase enzyme. Another reference in the 2014 Journal of Molecular and Cellular Medicine states that: "Urtica dioica agglutinin, a specific lectin from stinging nettle root is widely used in prostate cancer treatment." Nettles are additionally a blood and lymph cleanser. When your liver is not over-burdened with toxins, seasonal allergy symptoms are less likely to be a problem. 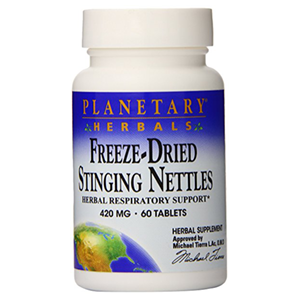 Freeze-dried powders are often recommended as a preferred choice, but concentrated teas can likewise be consumed several weeks before allergy season to provide stinging nettle benefits. 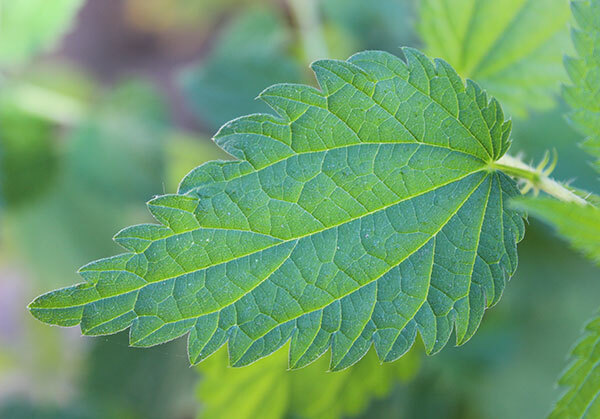 As an expectorant, nettle leaves are helpful for expelling mucus and can be an effective ingredient in herbal teas specific for coughs, flus, colds, bronchitis and pneumonia. The cleansing effect of nettle leaves are additionally helpful for their cooling effects that soothe inflamed conditions and have long been used as a folk remedy for arthritic disorders. 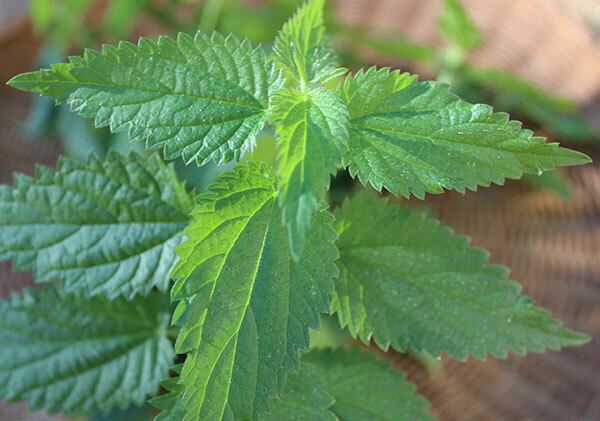 Traditionally used directly on the skin as a poultice or by soaking in strong nettle infused bath water, nettles have been known throughout the ages for offering relief to painful joints and sore muscles. The cleansing, antiseptic and nutritive properties that nettles have on the body are also very health enhancing to the skin and hair. 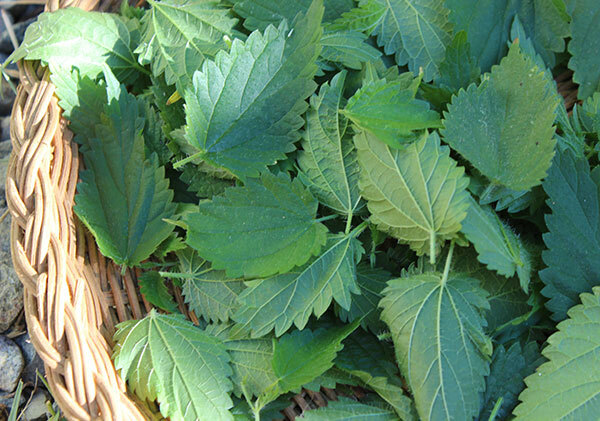 For this reason, nettle is often a top ingredient used in natural skin and hair care products. Nettles can be used as a tea or poultice incorporated into paste, creams and salves good for treating various skin conditions. 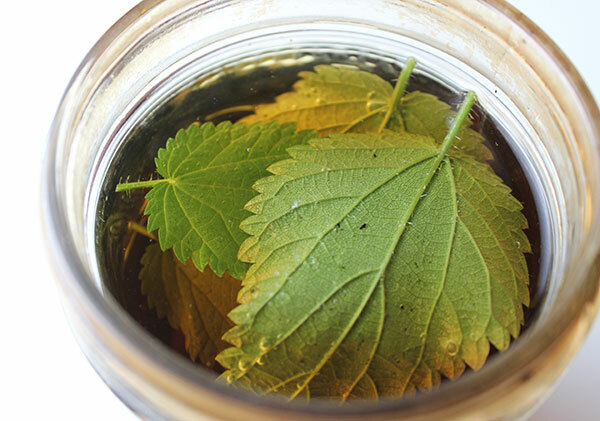 Strong nettle tea infusions also make a nourishing scalp and hair wash.
1) Wear necessary protective clothing and use gloves. Do not attempt to hold nettle by the stem with bare hands as you will most likely get stung. A thick pair of latex gloves works very well for holding and harvesting nettles. 2) Cut only from the first 5 inches of the plant, so it is able to continue its life cycle, re-seed itself and grow back the following year. 3) It is best to harvest nettle before its begins to flower for highest nutritional qualities, selecting dark green healthy leaves and stems. The young shoots can also be collected and often have fewer stinging hairs. 4) When searching for wild nettles, keep in mind that they are usually come up in the same location year after year. The plant will go dormant in cold winter climates, but will start to grow back in early spring. 5) When wildcrafting wild edibles it is always best to collect your herbs in unpolluted areas, far away from roadsides or industrial complexes. 6) Nettle roots can be gathered in the fall season from large nettle patches, which will leave enough to ensure continue growth. 7) Always use a wild plant identification guide if you are at all unsure whether you have the right plant species. 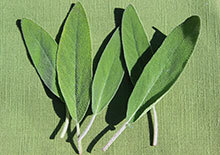 Some wild greens are poisonous and even deadly, so beware and ALWAYS be cautious. It is very easy to grow your own nettle either from wild seeds, nettle cuttings or purchased nettle starts. Rudolph Steiner, who promoted the use of nettle teas, also recommended it for use as a biodynamic spray to increase vegetative growth and as a useful insect repellent. Nettles make a great companion plant in permaculture design, known to benefit the growth of other herbs and vegetables and encourages the proliferation of beneficial insects. 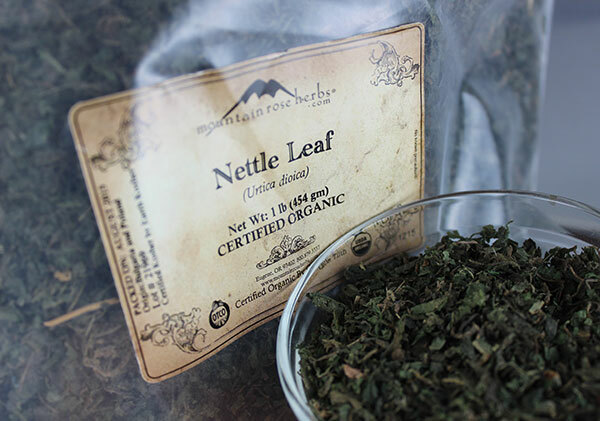 Fresh Nettle Leaf - Harvested nettle can be prepared appropriately to remove stinging components and used as a leafy green vegetable or in herbal teas or tinctures. Dried Leaf or Powders - Fresh dried herb and ground powders can be infused in hot water, encapsulated and tinctured in alcohol or vinegar. 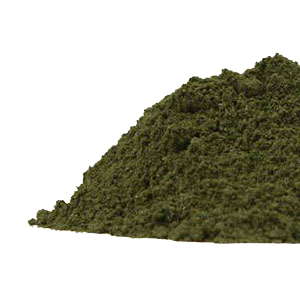 Freeze-Dried Leaf Powder - Freeze-dried nettle leaves ground into a powder. 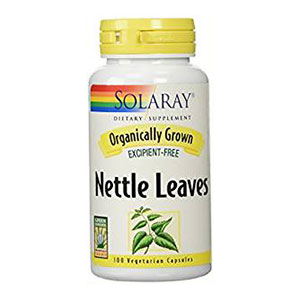 Nettle Leaf Extract - An alcohol based tincture of the fresh or dried nettle leaves and/or stems. 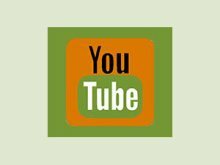 Fresh or Dried Nettle Roots - Nettle roots can be simmered as a tea decoction or tinctured. 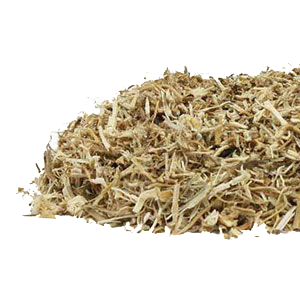 Nettle Root Extract - Nettle roots prepared in an alcohol menstruum or commonly sold commercially as a powdered hot water extract. Stinging nettle needs to be appropriately prepared by hot water infusion, maceration, drying or tincturing methods. This allows for their safe consumption and deactivates the formic acid content found in the stinging hairs. Some people eat nettle leaves raw in salads after skillfully rubbing off the hairs, but this is not something we recommend attempting. 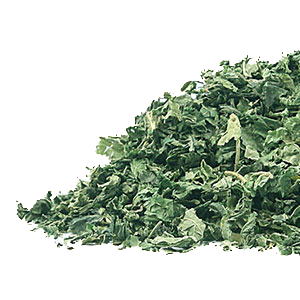 Fresh or dried nettle leaves make a great vitamin-mineral rich tea and are an easy way to assimilate the benefits of this energizing plant. 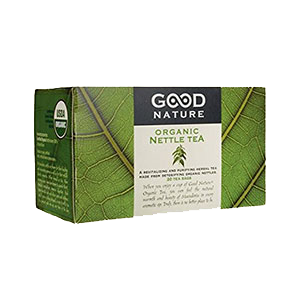 Nettle tea has a mild to strong flavor, depending on amount used, and tastes similar to vegetable broth. Concentrated tea infusions can be used as soup stocks or as a liquid base in drinks, green smoothies or as a nutritive replacement for water in most recipes. The leaves and shoots can also be prepared as a lightly steamed or blanched leafy green vegetable or used to make fresh nettle juice. Cooked nettles have a similar flavor and texture to that of spinach and can be used in many dishes as a spinach alternative. Raw nettles make an excellent ingredient processed into pesto sauces or blended into salad dressings and dips. 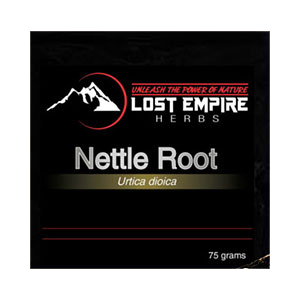 Nettle root can be taken as a liquid or powdered extract or used dried in tea decoctions. 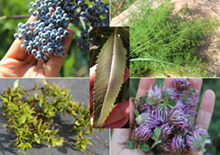 For more on harvesting wild edible plants and greens visit the links below. In rare cases, excessive nettle tea or juice consumption may cause a skin rash, redness and possible swelling. Consult a qualified healthcare practitioner before using nettle products, particularly if you are pregnant, nursing, have a serious medical condition, asthma, allergies or taking prescribed medications.